But tonight would be different. I was scheduling my day meticulously to leave school on time. Not only that, I was going to sit up at the very, very front and look at Maharaj’s (Radhanath Swami is affectionately addressed by his followers as Radhanath Maharaj) face the entire time! Night fell. Despite my planning, I was still at school. Still practicing for my exam. The lecture had begun. The pandal was so close by the Academy that I could hear the echoes of the microphone as Maharaj spoke. I felt spikes of pain to be so close yet so far. My hopes from the whole day crashed around me. And yet at the same time, I knew that by being here, studying for Krishna, that was what Radhanath Swami himself would’ve wanted of me. Later that night, I was walking home from dinner with my friend Jahnava. We were turning a corner on the road when I saw up ahead a figure in orange, walking by himself, his orange cloth lit up by a streetlight behind him. At first I thought he was a brahmachari. “Oh my, Maharaj!” I exclaimed. I immediately knelt to the dust to offer my respects. Jahnava also knelt. By the time I had stood up, Maharaj had walked up to both of us, his eyes shining, his face beaming. “I am very well, Maharaj,” I said, and I was thinking I would just end it there. After all, this was someone who only an hour before had been speaking to 4,000 people. Surely he had other things to do, other people to talk to. But I found no such mood of rush in Maharaj’s face or his voice. He simply wanted to know how I was. And so I shared with Maharaj a little about Mayapur Academy, and we spoke about how to learn the essence of every ritual we do. He said that he may come to my graduation in March to hand students their diplomas. “I may hand you yours,” Maharaj said with a smile. Then we folded our palms and bid each other goodbye and goodnight. Jahnava and I continued to walk home, and my eyes were wide and shining. The holy land of Mayapur seems to grant wishes. Krsna fulfils all the desires of all the people from time immemorial. All glories to HH Radhanatha Svami Maharaja. Krishna always fulfill all spiritual desires of his devotees….. Thank you for sharing this wonderful experience. 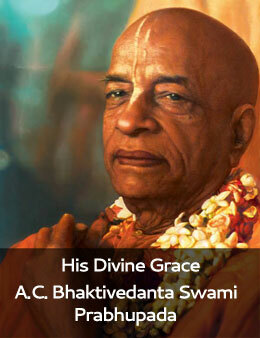 This is yet another evidence of the fact that God fulfills the desires of His sincere devotees. Thanks for this wonderful article. Another glimpse into the loving heart of Radhanath Swami. This relationship of Guru and disciple is not of this world as HH Radhanath Swami in the role of a transcendental spiritual master fulfills the genuine desire of all his disciples. Excellent experience and thanks for sharing this touching story. all glories to you and Maharaj. Radhanath Swami Maharaja is very very very personal. He never makes anyone feels that he has other things lined up when he is conversing them. All Glories to him !! Thank you very much for sharing this heart touching story. Amazed to see that such a renowned sadhu have so much for his disciples. Thank you very much for sharing such a wonderful story with Radhanath Swami. He is always concerned about the spiritual well being of every living entity. Our all wishes will be granted if one day we get to speak to Radhanath Swami.Thanks for sharing. wonderful experience and thank you sharing it with all of us, All Glories to Gurudev, Haribol!! Yes Sri Dham Mayapur is an ocean of fulfilling wishes and the deities of Sri Sri Radha Madhav, Panchatatva & Lord Narshimadev are so very special and merciful, All Glories to Gurudev, Haribol!!! This is example how Radhanath Maharaj loves his disciples and care for them.Radhanath Swami said in his Vyas Puja address that “I am yours (of disciples)”.This story proves this statement. Just yesterday, I watched a video recording of Kirtan sung by Bhakti Lata Devi. You appear so much spiritual charged up. Most of the credit for this goes to your spiritual master, isn’t it. Radhanath Swamiji is very close. to his disciples and care and love them from his heart. All glories to Gurudev. Thank you so much mataji for sharing your wondrful exeperince. Thanks you very much for sharing this experience with Radhanath swami. Radhanath Swami Maharaj always makes each devotee feel special whether he is giving class to 4000 people or talking personally to someone. Hari hariii. It’s very touching incident. Your sincerity is the key for dhaam to fulfill your desire mataji. Krishna & His representatives fulfills the desires of sincere devotees. A great example for the same !! Amazing! Such a nice moment… Thanks for sharing. I could relate to this incident as Lord, his dham and his pure devotees actually fulfills all our desires which would help and encourage us to advance in our Bhakti. Thank you for sharing. Hari bol wonderful… Mayapur dham is really wish fulfilling ….. Such sweet interactions of Maharaj with the devotees, keeps us alive.